TOFU BURGERS. Yes. This is for real. As in, regular hamburger-style tofu burgers that stand up to being grilled and could probably fool any diehard meat eater into loving them. I’m not kidding here, people. Remember the other day when we made this crunchy & colorful Thai salad together and it was wonderful and I told you that you’d be needing it for another recipe soon? That recipe is these tofu burgers and your mind is about to be blown. These tofu burgers are AMAZING. Sweet and spicy with a slight crisp on the outside and tender perfection on the inside. 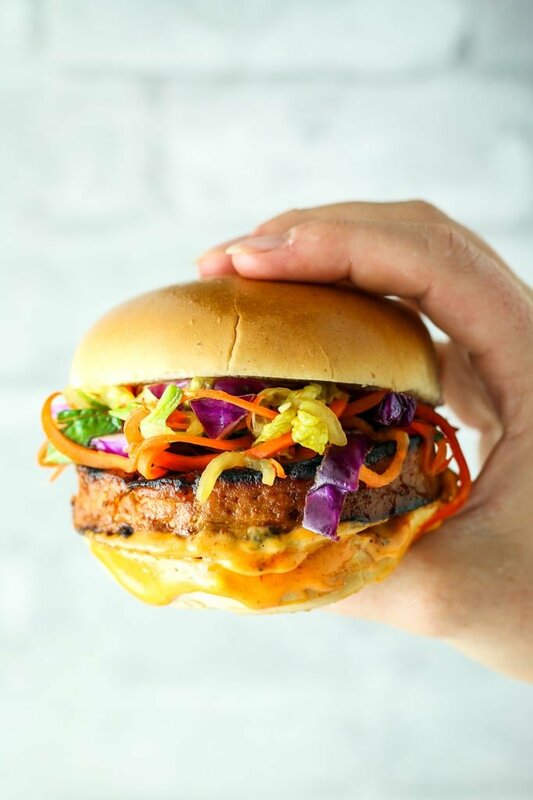 These tofu burgers grill up like a dream, meaning you have a brand new veg option for your next cookout. These tofu burgers don’t look like tofu at all. They look like actual burgers. 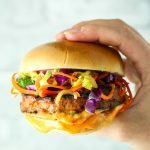 These tofu burgers have flavor and texture that you would never expect from tofu. The BOMB. With this recipe, it’s alllll about the marinade. There’s the tiniest bit of prep involved with the tofu – drain, press, cut into burger shape. You’ll need a round cookie cutter like this if you don’t want to try free-handing it.  But other than that, you just have to mix up the marinade and toss the patties on the grill (or bake!). I planned on getting this recipe out a week earlier but life had other plans like flying home to help my parents move out of my childhood home and witness the sale of their business…. more on that in a later post. For that reason, I’m keeping things short and sweet today. More time for the grilling and eating of these burgers, am I right? SO – make these bad boys ASAP and tell me all about it. Deal? Deal. 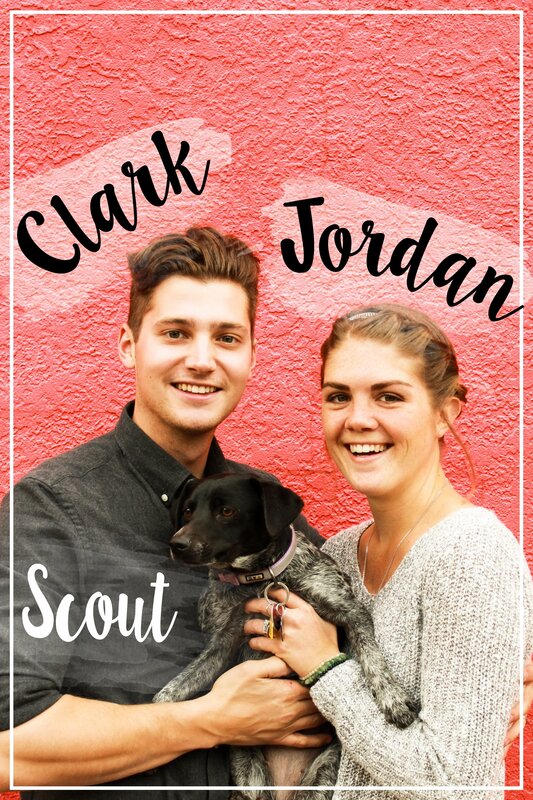 Tag me on Instagram so we can share your creation on our stories! Combine marinade ingredients in a large ziplock bag. Shake to combine. Gently place tofu patties in the bag and rotate a few times to coat with the marinade. Refrigerate 30 minutes to 4 hours to marinate. Meanwhile, combine spicy mayo ingredients in a small bowl and whisk together until smooth. 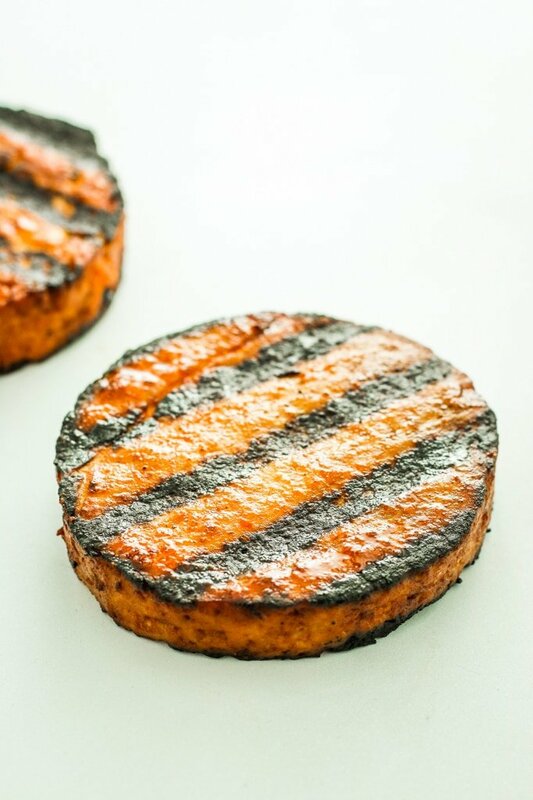 Heat grill to high and arrange tofu patties carefully on the grate. Grill 10 to 12 minutes per side. 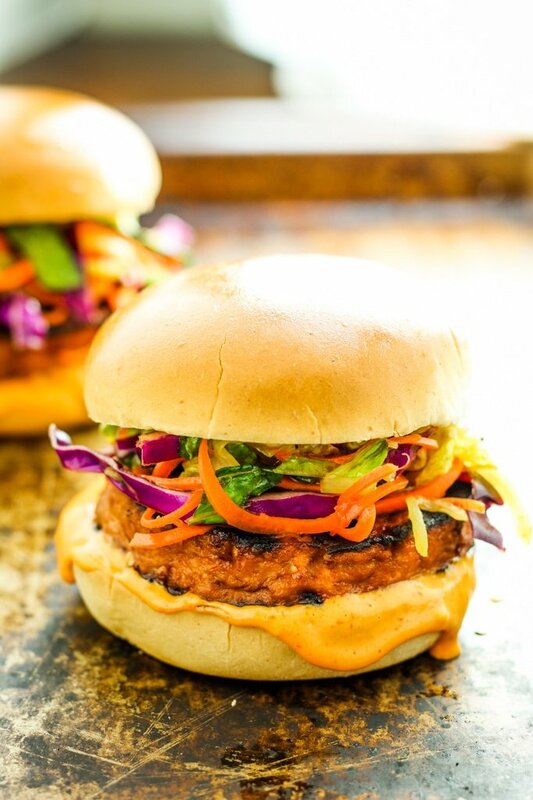 Add tofu patty to a bun, pile on your favorite toppings, and enjoy! These can also be made in the oven! Preheat the oven to 400º. Line a baking sheet with parchment and arrange patties on the sheet. Bake 8-10 minutes, flip and return to oven for 8-10 more minutes. How thick should the “burgers” be? Tofu comes in different sizes, especially here in Rwanda. I can estimate, but thought it would be good to get a recommendation. Hmmm… good question! Our burgers are usually about 3/4″ thick. I want to try this. Question is what is vegannaise and do you have a recipe for it? Hi Pam! Vegannaise is simply vegan mayonnaise. I don’t have a recipe for it, but you can find it at most major grocery stores and supermarkets! Also, if you’re not vegan, you can certainly use regular mayo. Hi Paige! 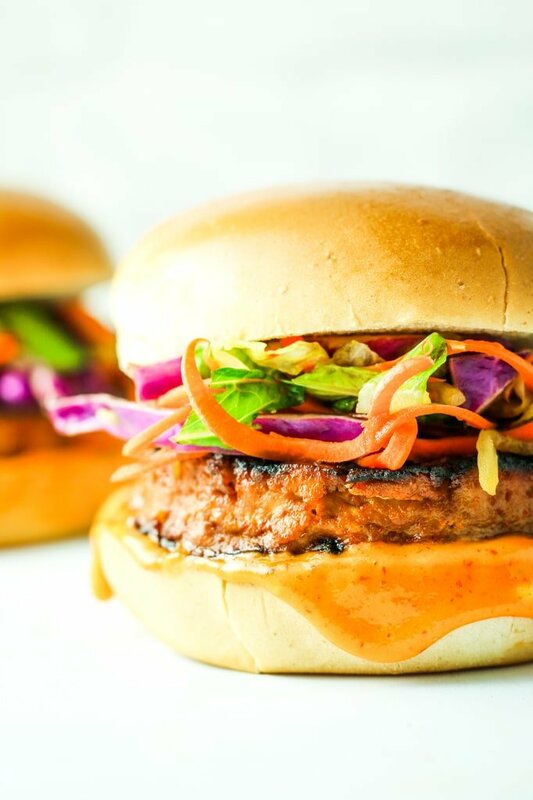 We topped these burgers with our Thai salad and a spicy mayo sauce. When you say combine all ingredients except the tofu do you mean the ingredients for the spicy mayo sauce too? Is the spicy mayo sauce part of the marinade or to be added later? Thank you. I cooked this on my George Forman grill, delicious! Honey is not vegan….please use agave! I’m aware that honey is not vegan. That’s why I say to use maple syrup or honey….. I made this for dinner tonight and it was so good! I was wondering when I saw the first pic how you got the burgers so perfectly rounded :) Such a great idea! Can’t wait to try these! Those round cookie cutters are one of my favorite kitchen tools – I use them for so many things! These look beyond amazing! Such bold flavors and colors- absolute burger perfection! If I were looking at just the pictures, I would never know this was tofu! I have to admit I don’t experiment with tofu nearly enough in the kitchen, but I’m excited to try these burgers! Wow, these look amazing! Such a great way to shake up tofu, especially for the summer! Yum! I am pretty sure I should just bite my screen right now! I am in love with the pictures! My tofu at home always comes out so bland, love this idea! Maybe I’ll finally make one that I’m like helllloooo I love you. This burger is calling my name! Looks so delicious! Love the sweet and spicy flavors going on! So what you’re saying is stir fry that I can eat with my hands?! Sign me up! You had me at sweet and spicy! Those bright colors and the flavor combo has me drooling, they look so good!